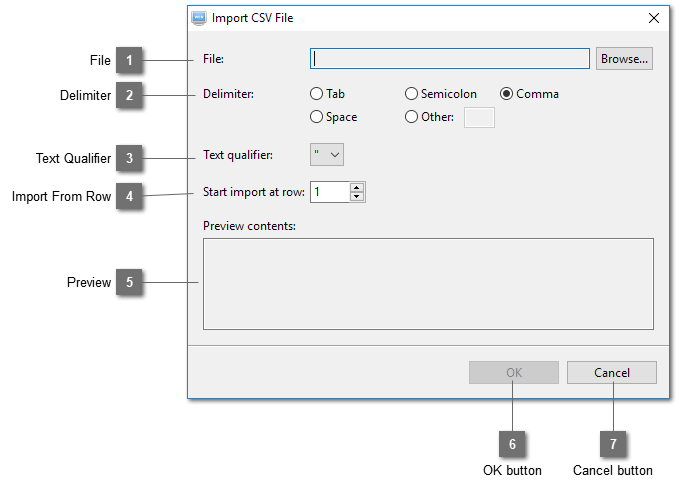 Select the CSV file to be imported. Each line of the CSV file should contain at most 3 columns and in this format - "Item 1", "item1", "no". If the file has only two columns, the third one will automatically be "no". If the file has only one column then the second column will be the same as the first column and the third column will be "no". Select the delimiter used to separate each column. Select which line to start importing. This is useful if the file has header row. Default is to import from line one. Preview a portion of the imported data using the above settings. Cancel importing and close this dialog.